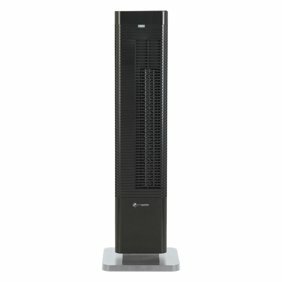 Electric Space Heater Heating Method Fan Forced No Heater Voltage 120VAC 1500/1000 Watts Max Surface Temperature 167.90 Degrees F Height 5-1/2 In. Width 4-1/4 In. Depth 6 In. 60 Hz 1 Electric Heater Phase 12.5/6.25 Amps AC 5118 / 3412 BtuH Output Cord Length 72 In. NEMA Plug Configuration 5-15P Heater Color Black Air Temp Rise 165 Degrees F Number of Heat Settings 2 Fan Only Features Auto Overheat Shut Off Protection Power Indicator Light Thermal Safety SwitchWARNING: California ResidentsThis product can expose you to chemicals including Styrene, which is known to the State of California to cause cancer and birth defects or other reproductive harm. For more information go to www.P65Warnings.ca.gov.